The autumn movie season has reached our shores and with it the Hollywood films that are receiving awards buzz. The latest buzz-worthy film to arrive here is DEEPWATER HORIZON, a movie “inspired by true events”, which is legalese for “taking liberties with the facts”. In case you forgot the tragic events of April 2010, Deepwater Horizon was the world’s largest offshore oil drilling platform at the time. It went up in a ball of flames, killing 11 crewmen, and the ensuing seepage of about 800 million litres of oil from the seabed devastated both the environment and the communities along the Gulf of Mexico coast that rely on fishing and tourism for their livelihood. The film, DEEPWATER HORIZON, only deals with the explosion half of the story, which is too bad but, then again, the movie would have been four hours long otherwise. Certainly, a film needs to be made about the environmental damage half. But in this film, we meet Mike Williams (Mark Wahlberg), rig operator Transocean’s electronics technician. Mike is just your everyday guy, happily married to Felicia (Kate Hudson) and father to a sweet, 9-year-old girl who just adores him. As the story begins, Mike heads off for another 21-day stint on board the rig. When he gets there, we all learn that the rig is 43 days behind schedule in pumping oil from the Macondo Prospect and the boys from BP are on board to get things moving faster. The Schlumberger boys are also there but they’re leaving just as Mike arrives. They’ve poured the concrete bed over the sea floor where the drilling will take place but BP feels there are billions to be made so why wait for the concrete to set? At BP well site leader Don Vidrine’s (John Malkovich) insistence, the Transocean crew conduct some safety tests on the drilling pressure, but the results prove inconclusive. Nevertheless, Vidrine presses forward against the better judgment of rig boss “Mr. Jimmy” Harrell (Kurt Russell), and gives the go ahead to start production. Now it doesn’t take a genius to know that disaster is waiting for them around the corner. Sure enough, a mixture of drilling mud, seawater and methane rushes up the pipe. The gas expands, coming in contact with the rig’s exhaust system, and ignites. Within seconds, everything is exploding around the crew, raining fiery shrapnel down on them. Himself injured, Williams manages to rescue many of his colleagues, bringing them to safety. There’s no arguing that this movie is one terrific roller coaster ride. Director Peter Berg (LONE SURVIVOR) keeps dialing up the tension as the crew’s situation becomes increasingly dire. (How anyone survived is truly amazing.) Wahlberg does a fine job as the movie’s hero and Russell, as always, delivers a solid supporting performance. Where the film loses though is on the dialogue. Until all hell breaks loose, there’s a lot of technical jargon being thrown about. If you’re a mechanical engineer, you’ll understand it. For the rest of us, it’s just “blah, blah, blah”. Then, when the rig starts exploding and fireballs race down its corridors, the dialogue switches to short sentences that all end in exclamation points, like “Watch out!” and “We gotta go RIGHT NOW!” It’s not very creative but perhaps it’s authentic. Speaking of authenticity, Berg created a replica of the rig that was 85 percent to scale. (The real Deepwater Horizon was about the height of a 40-storey apartment building.) The computer monitors seen in the film are also accurate representations of what was on the real rig. As a result, the film seems less CGI’ed than it would otherwise have been. It is impressive work that is worthy of an Oscar nomination for set design. 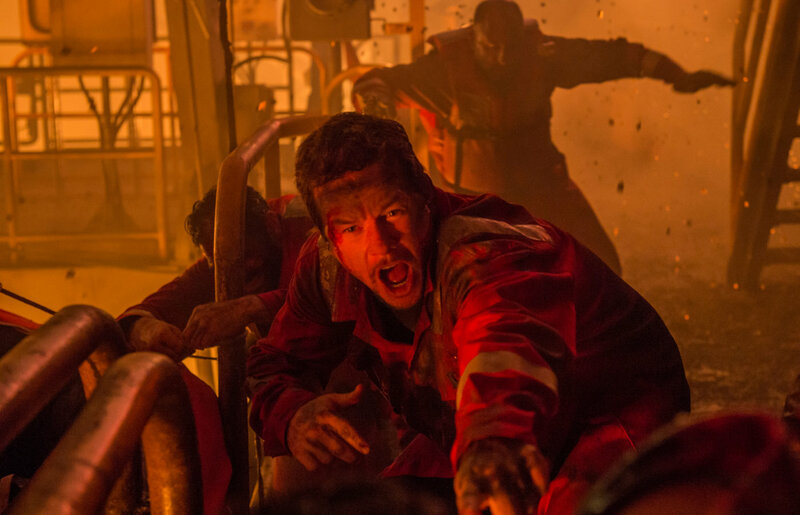 DEEPWATER HORIZON is a reasonably good film that rivets you to your seat. I saw it on a regular screen but it’s also showing in IMAX. It may be worth shelling out the extra bucks for this one.